NERD HQ Advertisement for Comic-Con 2012! Here and advertisement for The Nerd Machine‘s offsite event, NERD HQ! Second Annual NERD party will be bigger and better than ever at the HQ. Great sounds from Dominic Monaghan, Kinect dancing, drink specials and more. The Nerd Machine is ready to invade San Diego’s Gaslamp Quarter once again with an even bigger Nerd HQ. 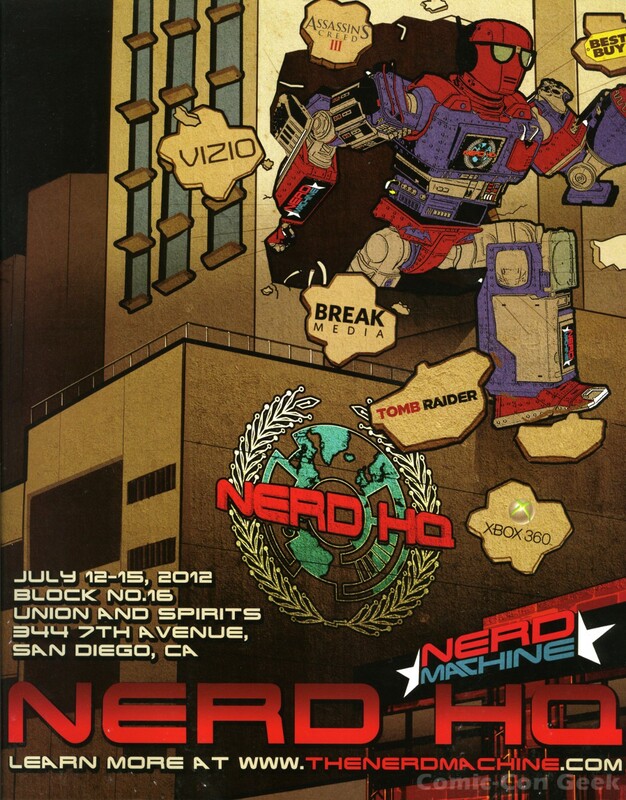 In partnership with Break Media, XBOX, and Vizio, Nerd HQ will be the highlight of the San Diego Comic-Con weekend. The Nerd HQ has moved to the newly created Block No. 16 Union and Spirits. which has over 15,000 square feet of gaming, technology, and entertainment for visitors to enjoy. The “Conversations for a Cause” panels are back as well and will feature some of your favorite Comic-Con icons. HQ will also be adding panels featuring gaming and technology. As always, 100% of the proceeds for the panels benefit Operation Smile. Break Media will provide Live Streaming of all the panels and daily highlight videos to make sure fans stay informed. As a bonus, SPIKE TV will be broadcasting live from HQ on Friday and Saturday to their network and digital outlets. Xbox, the gaming sponsor of the Nerd HQ, will once again fill the event with 40 gaming stations featuring the newest and yet to be released titles. Crystal Dynamics will debut the first playable demo of the completely reborn Tomb Raider franchise, exclusively at the HQ. Vizio, the technology sponsor of the Nerd HQ, will provide Laptops, Tablets, and PC’s for fans to demo. Their monitors will fill the space and fans will get to see their newest 3D technology with exclusive content for Nerd HQ. Our friends at Barco will be providing projection technology to create the largest 3D pixel mapping show in town. We look forward to adding the “Conversations” and live events schedule to the site and we will make sure to give all the nerds a week to prepare before tickets go on sale.